ROGUE ONE: A STAR WARS STORY is like a Russian nesting doll. It just keeps getting deeper and deeper and more layered as it plays out. And with each plot point a new surprise is revealed. The surprise here is that the film just gets better and BETTER! Suffice to say, ROGUE ONE is a fantastic debut for STAR WARS stand-alone films. The film works on so many levels – especially for the STAR WARS fans gasping at all the Easter Eggs and references to the films and animated shows. But you don’t have to be a fan to understand what’s happening. ROGUE ONE also works if you have no idea what that thing is in the middle of the frame (no spoilers here). Kathleen Kennedy and her team made sure that if this is your first Star Wars film, it will be very easy to follow without having seen the previous seven films. Taking place just before STAR WARS EPISODE IV: A NEW HOPE, ROGUE ONE’s story focuses on the grass-roots days of the Rebel Alliance. Word has gotten out that the Empire is building a super-weapon capable of destroying entire planets. Now they need to find the scientist responsible (against his will) for the creation of this weapon and the Rebels only hope is with his criminal daughter, Jyn Erso (Felicity Jones). Striking a deal for her freedom if she helps, Jyn is teamed up with Cassian Andor (Diego Luna) and K-2SO (voiced by Alan Tudyk) to find an Imperial defector Bodhi Rook (Riz Ahmed) who has a message from her father, Galen Erso (Mads Mikkelsen). 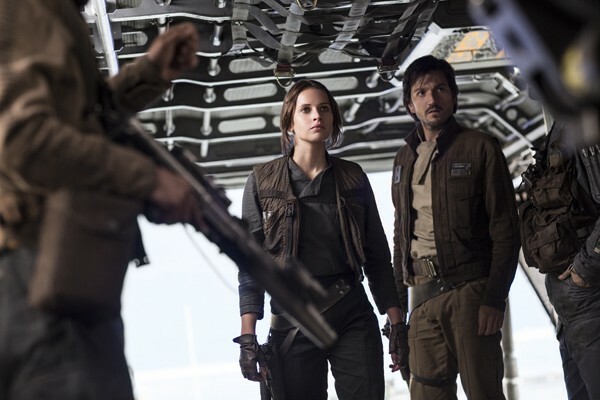 L to R: Jyn Erso (Felicity Jones) and Cassian Andor (Diego Luna), photo by Jonathan Olley ©Lucasfilm LFL 2016. Anyone going into this film uneasy because of the extensive reshoots, just know that the film works better having done this. It was during this period that intimate character-building scenes were shot and extended. And that is the strong thread that holds this film together. Jones and Luna work so well together that you can see each grow with every twist or turn that is thrown at them. As the film continues, there are places where lesser filmmakers would have made this a romantic story between the two just because it’s safe. That’s not what happens here. When the two look at each other you can see the admiration for one another. L to R: K-2SO (Alan Tudyk) and Jyn Erso (Felicity Jones) ©2016 Lucasfilm Ltd. All Rights Reserved. Cassian’s droid partner K-2SO is a combination of C-3PO on a dark day and Sheldon from the Big Bang Theory. He is direct to a fault which provides most of the film’s comedy. Then we have the team-up of Chirrut Imwe (Donnie Yen) and Baze Malbus (Wen Jiang). Chirrut is a blind Force-sensitive warrior who is not a Jedi, but he is still able to sense what is about to happen. Every once in awhile his friend and war companion the gruff Baze gives Chirrut a helping hand or laser blast. Director Krennic (Ben Mendelsohn), photo by Jonathan Olley ©Lucasfilm LFL 2016. Now let’s talk villains. Director Krennic (Ben Mendelsohn) is a great departure from what we’ve seen from Star Wars bad guys in the past. There’s no mask, no tattooed face or blue skin, no black cloak and hood, just a white cape. Director Gareth Edwards made a great analogy to the entrance of Krennic vs. Darth Vader in A NEW HOPE. Here we see Krennic, all in white, with black Stormtroopers invading the farm of the Erso family. Whereas the black clad Darth Vader is flanked by the white armored Stormtroopers as they invade the Rebel blockade runner. Both are terrifying in their own way. Krennic does what he has to to get ahead in the Empire even if that is tearing apart his old friend’s family. Those going in wondering about the digital Grand Moff Tarkin, well, if you’re going to scrutinize and nit-pick then he will have a digital look the same way Michael Douglas did in Ant-Man. I would be very curious to hear from anyone who isn’t the wiser on this effect. Those responsible for his animation were 100% spot on with his mannerisms and movements. I’ve been a big fan of Peter Cushing since the Hammer Horror days and he does have a specific way of moving that is captured here. The STAR WARS you’re used to seeing is black and white. The good guys vs. the bad guys. ROGUE ONE: a STAR WARS Story introduces shades of gray. It is a war film, and while there’s no graphic violence, people are pointing guns at each other and death is depicted throughout the film. Even our heroes display qualities and actions that some may think twice before showing to their children. 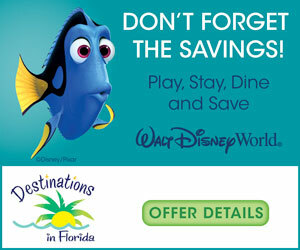 My advice: pre-screen this for your kids. Only you can make the decision whether or not they are old enough to handle the violence. Prepare for questions! Let’s talk about the music. 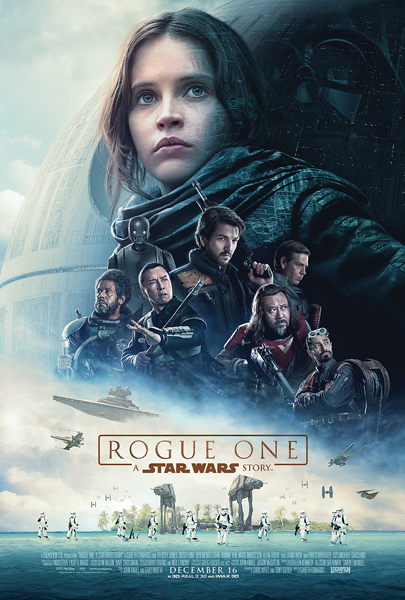 There has been some controversy regarding this, as Alexandre Desplat (THE KING’S SPEECH, HARRY POTTER AND THE DEATHLY HALLOWS 1 & 2) was originally slated to score ROGUE ONE. However, due to scheduling conflicts, Michael Giacchino (INSIDE OUT, STAR TREK (2009), CALL OF DUTY (video game)) stepped in and had just 4 ½ weeks to score, record and complete the soundtrack. He is a HUGE STAR WARS fan, and it absolutely shows. The soundtrack soars. There are specific original John Williams themes – listen for The Force theme, the Imperial March and some fun callouts to the Rebel theme and Trench run music from A NEW HOPE. But my favorite thing about Giacchino’s score is the soaring orchestra as we move from one planet to another in establishing shots throughout ROGUE ONE. It’s gorgeous and I cannot WAIT to get my hands on this soundtrack. It will make a fine addition to my collection. When leaving this film, you’re going to want to watch A NEW HOPE immediately. Give in to your desire. It will become more clear why it is now called “A NEW HOPE”. This “hope” is a fantastic message to anyone who just needs an extra incentive to take the next step in life but is being held back because of fear. ROGUE ONE is a new hope for STAR WARS stand-alone films. Watch, enjoy and hope that the next STAR WARS film is just as great. ROGUE ONE: A Star Wars Story debutes in theaters on December 16th. Let us know what you think in the comments below.